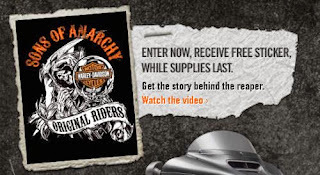 Get a free Harley-Davidson®‎ Sons of Anarchy Sticker. Click the link below to go to the Harley-Davidson®‎ website. Once o n their website click on "Watch Video" to enter to receive a sticker while supplies last.